Groovy! Ash vs. Evil Dead Gets a Second Season! We haven’t even heard the chainsaw hand rev up for the first time and Ash Vs. Evil Dead has already gotten a renewal for another season! Just days out from the Halloween premiere on the STARZ network, the continuing saga of Ash against the Deadites (this time on the small screen) has already gotten the green light for a second season. While exciting news it makes me wonder where the end of the first season will leave our heroes. The sophomore season will air in late 2016, perhaps around Halloween to keep the tradition alive. While the number of episodes wasn’t confirmed, Deadline has sources that tell them we’ll get at least another 10 episode season. And while they were at it the news outlet also reported that Bruce Campbell and Lucy Lawless were confirmed for another go around as well. Take a look at the first (NSFW) four minutes of the pilot episode if you haven’t already! 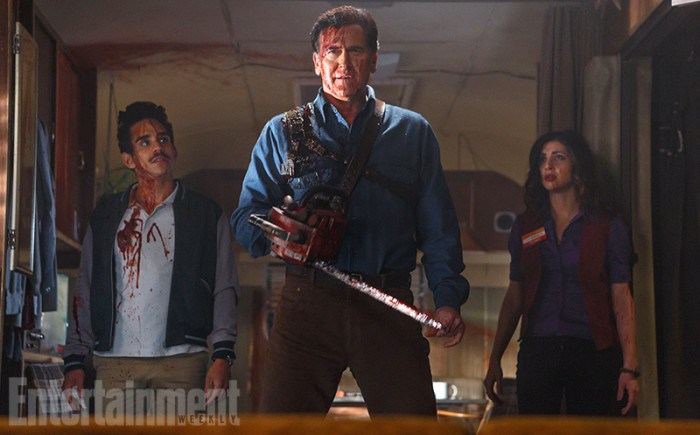 This entry was posted in Breaking News, Film, TV and tagged Ash Vs Evil Dead, Bruce campbell, sam raimi, starz. Bookmark the permalink. I feel bad saying this but I have only seen the original Evil Dead movie. I gotta watch Evil Dead 2 and Army of Darkness somehow soon.